Habitat: Freshwater lakes and streams of all sizes with mud, silt, sand and gravel benthic substrate. Description: Typically this bivalve grows up to 25 mm in length but larger forms are know which can grow up to 50 to 65 mm. C. fluminea has a yellowish brown to black shell with concentric, evenly spaced ridges on the shell surface. Origin and Distribution: Originated in China, Korea, southeastern Russia, and the Ussuri Basin. Now widespread in Europe and the United States. 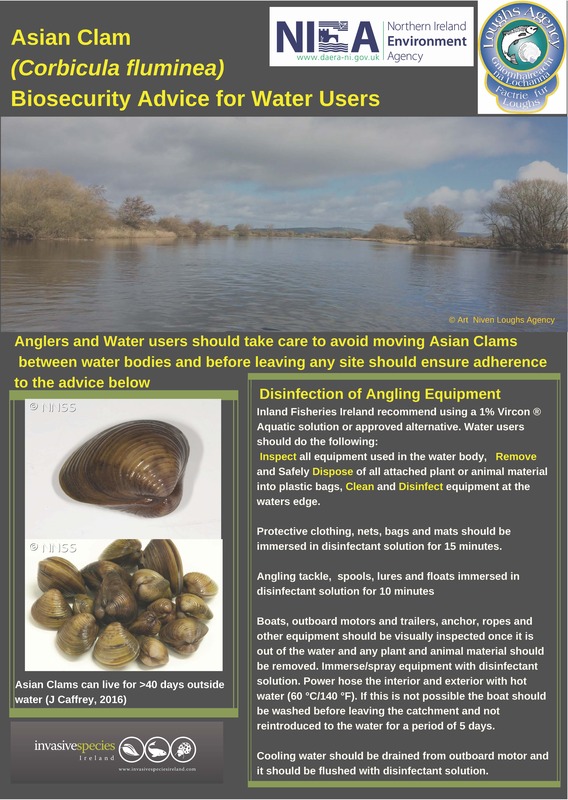 Asian clam reaches high densities and colonises suitable substrates. 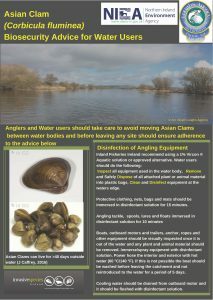 It has similar impacts to the zebra mussel, competing with other species for food and space. Water based industries, such as hydroelectric power stations and water abstraction for household use may be faced with higher costs due to the clogging of intake pipes by this species. In the US one estimate from 1980 put the costs of correcting this problem at an estimated 1 billion dollars annually (ISSG). They can also negatively impact on sand/gravel abstraction. How did it get here? 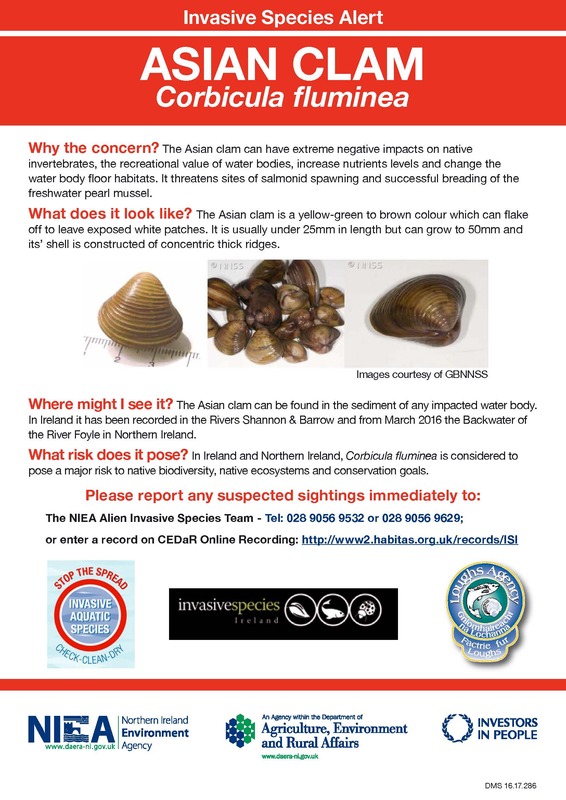 Corbicula could have been introduced to Ireland in boat bilge water as live bait or as a result of escapes from the aquarium trade. 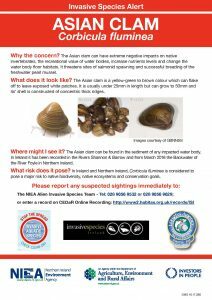 C. fluminea are known as "pygmy" or "gold" clams in the aquarium trade. It is now known to be present in the River Foyle, the River Shannon, Keeldra Lough (Leitrim), Lough Derg, The River Barrow and the River Nore. Biosecurity: All water users, follow the rules of the Check Clean Dry campaign to ensure good biosecurity protocols.